Hello Friends, Today I present shopping with a twist, themed shopping with Make Mine Pink. 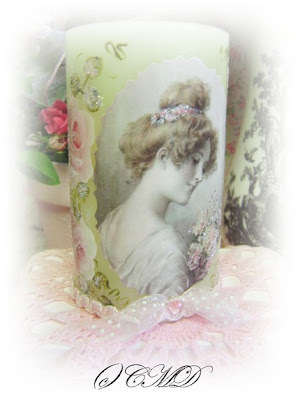 Click HERE to visit my shoppe and many others with "SIMPLY PINK" treasures. And, the Christmas in July begins today with many new treasures filling the shelves in my Little Pink Boutique. HERE and my Etsy Shoppe HERE. 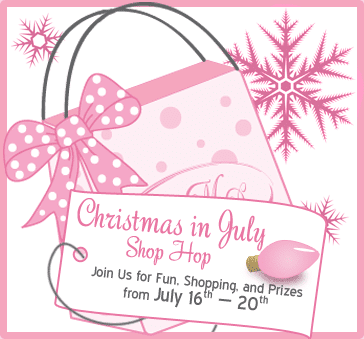 Christmas in July at MMP offers you an opportunity to earn points and win fabulous prizes when you see this logo in my shoppe. Simply click on the logo once you are in the shoppe (not here) to earn points when "YOU FOUND IT" It's never too early to think about picking up a gift or two and start Christmas shopping before the rush. The shopping starts July 16th through July 20th. Now that you are informed about all the wonderful shopping today, I will share a few studio treasures hitting the shelves in both shoppes. I invite you to visit both boutiques anytime, as everyone is welcome. This week has been crazy busy creating and so much fun. Recently, I went on our usual treasure hunt and found great items to redesign and repurpose. 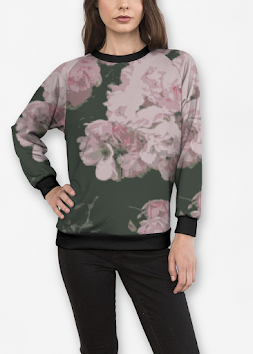 Here are a few items including my new design for Red Velvet Roses. 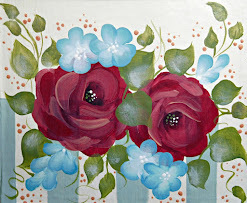 Inspired from my garden cut roses, this new pretty is rich red on a thrifty plate treasure by Fritz and FLoyd. The flameless candle at the top of this post is also a new design using a favoite Victorian graphic. I have painted on candles for years and going in a new direction with them now. This one is already sold, but more are on the way soon. They are flameless and have a wonderful real look flicker. Safe to be around pets and children. Some have a light fresh vanilla scent too. I just love them and enjoy them around our cottage too. Velvet Red Roses Plate, inspired by my Mr. Lincoln Cut Rose in my garden. Rose Nest Tray, Wall Decor, with sweet girl Victorian graphic. "There's Gladness in Rembrance", Keepsake Book Box. This box above just SOLD right after I posted this morning. It is going to a good home in Italy to Debby! Thank you! Pretty Pink Vintage Tea Pot Canister. I hope your days are Amazing and filled with God's Grace! All of your things look very beautiful. I'm heading over now to check everything out. Hope you have a blessed day. celestina, I have to as about the amazing grace sign. I use that phrase always. In fact, I am holding one of myfour"amazing graces", Sophia, as I Type. Please let me know if it is still available. Oh your gorgeous goodies never disappoint! I am loving your newest creations! You have been a busy girl, as always and so much amazing talent too! Love your newest look my friend! 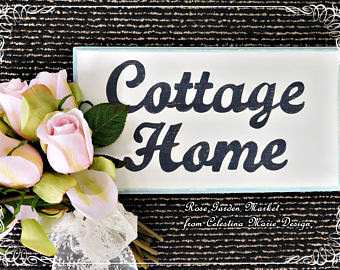 Also, thanks so much for your sweet comments about my friends cottage apartment! She is a treasure as you are! PS...we may some exciting news! Oh, everything is beautiful!!! The added touch of the lovely ladies in the center...divine! Such beauteous new goodies. LOVE the candles and your new spin. I can't have enough of those flameless candles! You have been one busy Lady and love all your latest creations. I have never heard of flameless candles and what a good idea, as you say around children and pets. Love the red velvet rose and plate and the tea pot canister. As always, everything is beautiful. Gorgeous work as always, Celestina Marie! Oh Celestina, you are an inspiration! What a beautiful idea. This is so inspiring and I love your Lincoln Rose. 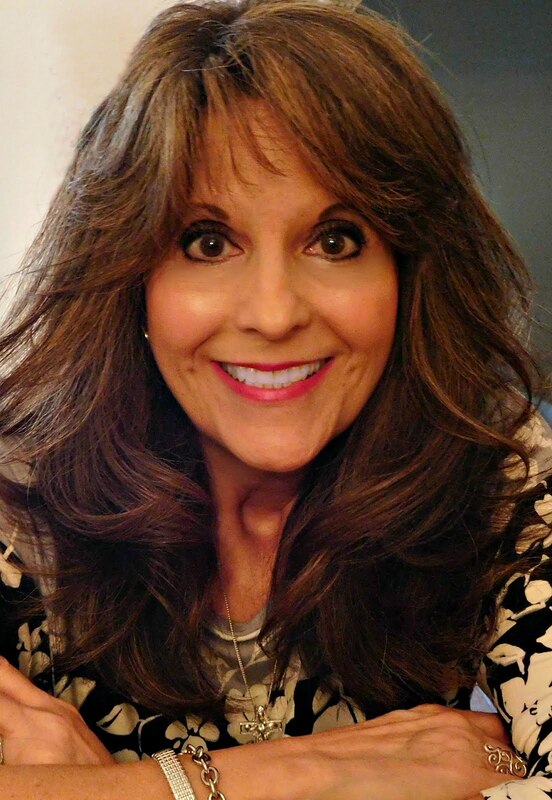 I love coming to your blog and seeing what you're up to! Gorgeous items! I love them all! I have set my darling box & items out for my special guests to see, and yes it's who you think!! Gosh I'm so excited Celeste! !